US Secretary of State Rex Tillerson released a press statement regarding Thailand's National Day. 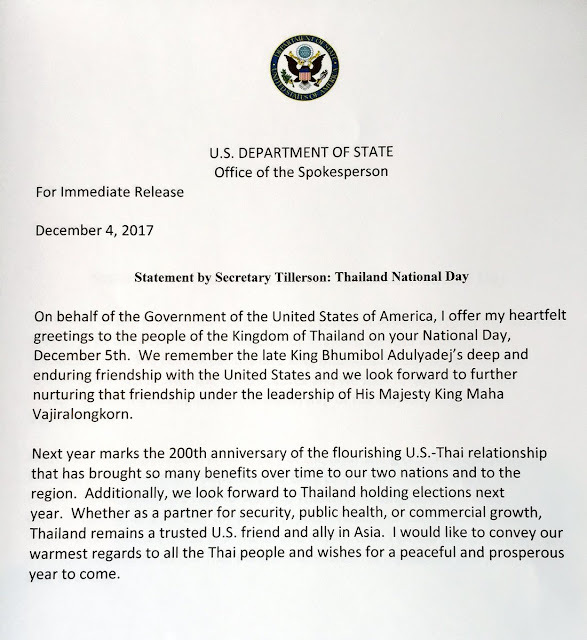 In it he expressed diplomatic greetings and well-wishing to the Thai people, but failed to resist also expressing American exceptionalism - stating, "we look forward to Thailand holding elections next year." While the statement may seem rather innocuous at first glance, it is anything but. Thailand's elections have been put on hold, following a 2014 military coup ousting the US-backed regime of Yingluck Shinawtra who served openly as her brother Thaksin Shinawatra's proxy. Thaksin Shinawatra resides abroad in Dubai, United Arab Emirates, a convicted criminal evading a 2-year jail sentence for abuse of power. He too was ousted from power in a military coup in 2006. Before being removed from power, he oversaw a brutal "war on drugs" in 2003 that left nearly 3,000 extrajudicially killed in the streets over the course of just 90 days. He also attempted to unilaterally sign a US-Thai free trade deal without parliamentary approval, sent Thai troops to participate in the US invasion of Iraq, and allowed Thai territory to be used as part of the US CIA's extraordinary rendition program. Since being deposed from power in 2006, Shinawatra has organized street mobs, militants, and terrorists, killing scores of people, conducting campaigns of mass arson, bombings, and assassinations as part of his bid to seize back power. He regularly meets members of his Pheua Thai Party (PTP) in Hong Kong, and has been allowed to travel across Europe, to the UK, and even to the US to conduct business despite being a fugitive and despite his human rights record. When Shinawatra's sister contested elections in 2011 as head PTP, the campaign slogan was literally, "Thaksin Thinks, Pheua Thai Does," an open admission that Thaksin Shinawatra, not his sister, would be running Thailand upon taking office. Despite the obvious illegality of a convicted criminal remotely running Thailand from a hotel room in Dubai, the immense impunity Shinawatra enjoys thanks to his foreign sponsors made it more than possible. The 2011 election results were heavily defended by the Western media and the legitimacy of Shinawatra's proxy government never questioned. 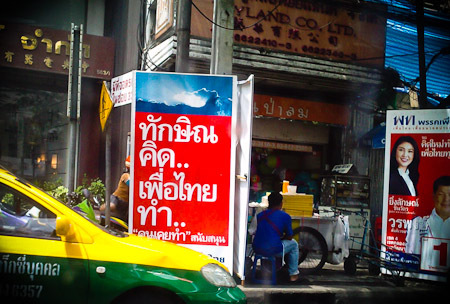 Image: The campaign sign reads in Thai: Thaksin Kit, Pheua Thai Tom" which translates to Thaksin Thinks, Pheua Thai [Party] Does - an open admission that a convicted criminal hiding abroad runs Thailand's largest opposition party and contested the 2011 elections. The military removed his sister from power in 2014 after Shinawatra's militants began killing protesters in the streets. Elections have been pushed back repeatedly ever since. 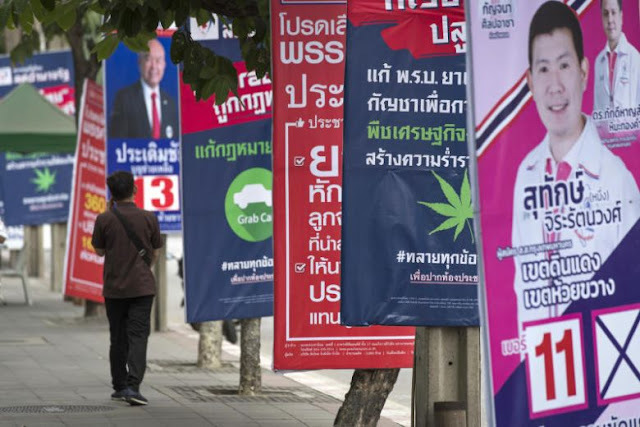 The reason is relatively simple - as long as the largest opposition party contesting Thailand's next election is openly led by a mass murderer and convicted criminal waging a campaign of terror against the Thai state from abroad, elections are untenable. A process is well underway to uproot Shinawatra's criminal influence over Thailand's political landscape before elections are held, but this process is continuously hampered by pressure from Western governments and the myriad of NGOs they fund. Shinawatra's networks of agitators, propagandists, lobbyists, and functionaries are being protected under the guise of "human rights" advocacy. Overt criminals and even terrorists are being labelled "political prisoners" by familiar names in the West's regime change machinery like Amnesty International and Human Rights Watch. 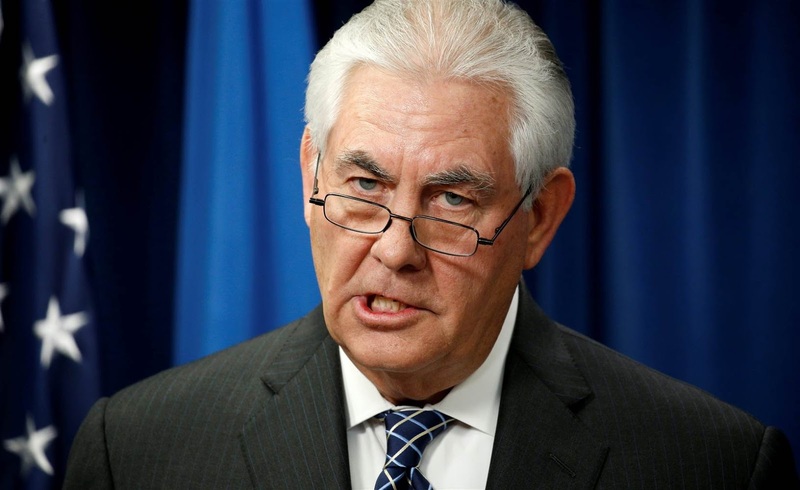 The US State Department itself is first and foremost in eagerly funding media fronts, agitators, and faux-rights advocates in Thailand who work in concert to excuse Shinawatra and his followers for their serial abuses and in support of returning Shinawatra to power. US-funded fronts like Prachatai, Thai Netizen, the Cross Cultural Foundation, Forty Rights, Thai Lawyers for Human Rights, and many more, repetitively demand expediency in holding Thai elections, knowing full well the likely victor at the polls will be Thaksin Shinawatra's PTP. They decry any legislative move that would make it more difficult for Shinawatra's proxies to return to power, or limit their power should they take office. Absent from these demands for expedient elections to "restore democracy" is any explanation as to how a government openly run by a convicted criminal and mass murderer from a hotel room in Dubai is in any sense "legal" or "democratic." Nor has any explanation been provided as to how removing Shinawatra's sister from power - who openly served as his proxy - was "illegal" or "undemocratic." It is yet another example of American exceptionalism and the tools of "rights advocacy" and "democracy promotion" it wields to advance it. At a time when US ties with Russia are strained by repetitive accusations of "Russian interference" in Western politics - specifically elections - the US Secretary of State obliquely demanding expedient elections in Thailand knowing full well who will take power and whose money and influence is responsible for such an outcome -illustrates just how one-sided America views respecting national sovereignty and staying out of foreign elections. For Thailand, preventing Thaksin Shinawatra from returning to power in any form is certainly a priority, but if the network of money, power, and foreign sponsorship that has maintained Shinawatra's staying power is not dealt with, another "Shinawatra" will simply take his place. A process of forging ties with other nations to reduce the amount of dependence on and influence form the West is already well underway in Bangkok. It must continue and expand. The frustrating hypocrisy of the US and its real-world implications is owed to its unwarranted power and wealth. Nations collectively taking steps to minimize that power and wealth in the form of a multipolar world order is key to confronting and dealing with those implications.